Looking for a tasty, easy appetizer to serve at your next party? Then give these tasty little bites a try. With only three ingredients you really can’t go wrong. 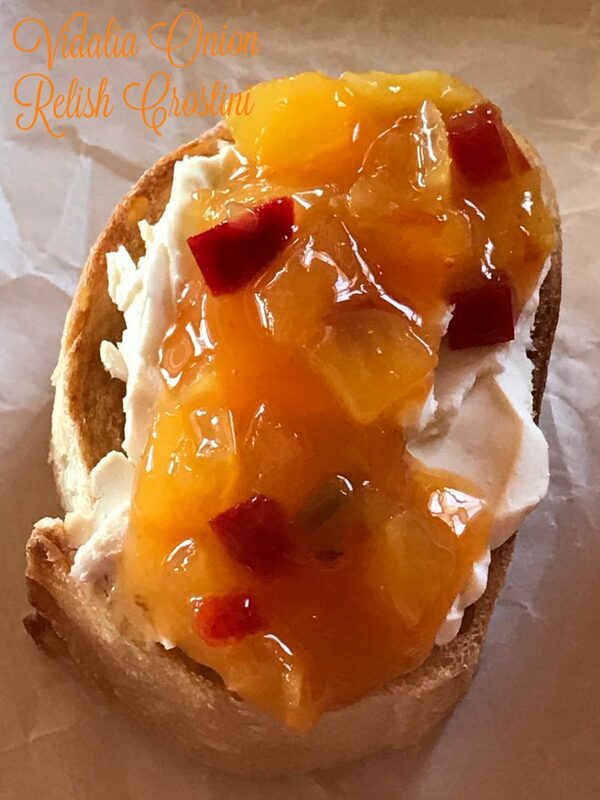 The “star” of this easy recipe is a fantastic Vidalia onion relish that my daughter brought back for me on her trip to Disney. My daughter and her family flew into Atlanta, visited some friends for a few days and then drove to Disney. On their drive back from Disney, they stopped at Sunbelt Plantation. 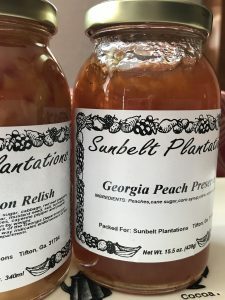 Sunbelt Plantations is located in Tifton GA. A beautiful state that I fell in love with while visiting, some years back. 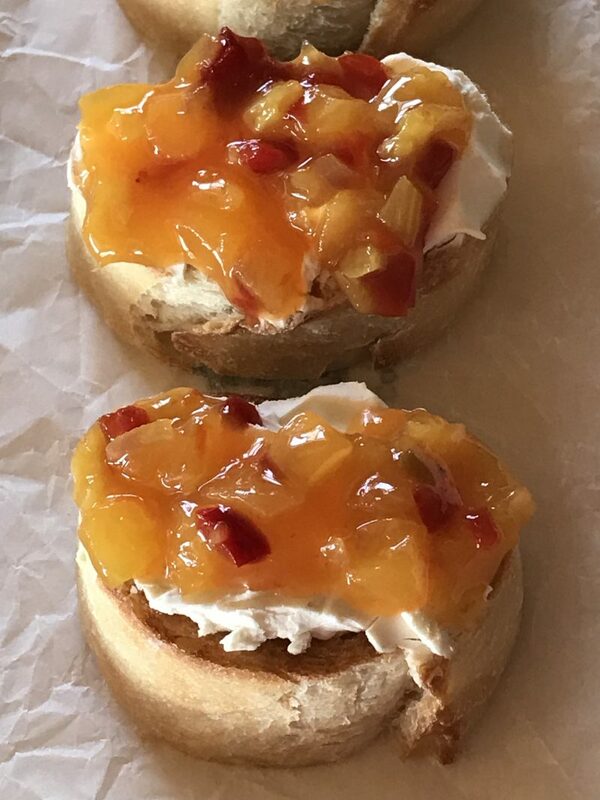 My daughter picked me up a jar of Georgia Peach Preserve and Vidalia Onion Relish. The peach preserves we ate up right away, delicious served on scones or an English muffin. Next, we tried the Vidalia Onion Relish. We tried Vidalia Onion Relish on…What else…a Wisconsin bratwurst! Two states collided together and we enjoyed a delicious grilled Wisconsin bratwurst topped with the sweet taste of Georgia Vidalia onion relish. I was first introduced to Vidalia onions about 20 years ago when I worked at the Cracker Barrel Old Country Store. A Vidalia onion is a sweet onion grown exclusively in Georgia. The onions are called Vidalia because of where they are grown; Vidalia Georgia. 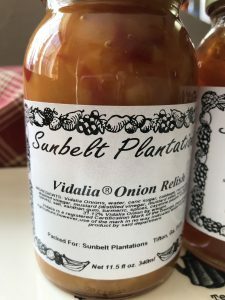 The growing of Vidalia onions started there in the early 1930’s. Vidalia onions are sweet due to the low amount of sulfar in the soil in which the onions are grown. The Vidalia onion was named Georgia’s official state vegetable in 1990. One of our most requested and visited recipe here on Turnips 2 Tangerines is this recipe for Cheddar and Ritz Cracker Vidalia Onion Pie. Not only is this recipe one of my favorites too, I found the recipe on the Vidalia Onions website. Slice baguette into 1/2-inch to 1-inch slices. Brush each slice with oil. Place slices on a baking sheet lined with parchment paper. Place in the oven under the broiler until slices are lightly browned and toasted. Remove from oven, cool a few minutes. 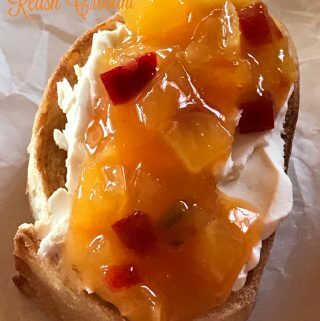 Spread cream cheese on each slice and top each slice with onion relish. Serve immediately.